In every reviewer’s case history there’s a little file marked ‘Don’t Go There’. Its meaning, dear reader, is that recordings by certain musicians are simply out of personal bounds when penning reviews whatever the reason, which can range from a simple antipathy to the musician(s)’ playing via an abhorrence of a particular group collaboration to the simple fact that said person or persons promised the moon on a stick but delivered a donkey with a nosebleed. 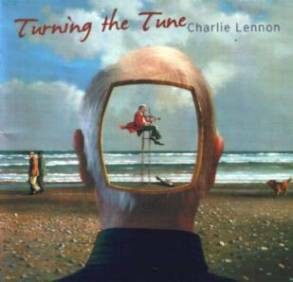 Now, much as I appreciate Charlie Lennon’s contributions to the world of Irish traditional music and beyond, especially his many compositions, I find myself unable to write an actual review of this double album which, for the literal record, consists of one CD of tunes derived from other musicians and a second filled entirely by Charlie’s own works. Believe me, Charlie has never delivered a nasally-challenged moke to my door nor has he ever, to my knowledge, taken part in unmentionable bands. So please just be content with the fact that my ears and the sound of his fiddle just don’t get on. I appreciate many others do enjoy his playing and they’ll find lots to enthuse them here, though, like me, they may well be perplexed by the import of the album’s Magritte-influenced cover. Were the lifeguards at Salthill informed? So let’s stick to facts. There are thirty tracks, predominantly jigs and reels, plus a few hornpipes and the odd barn dance and strathspey, as well as one air and one lament. Charlie plays fiddle, viola, piano (and oh, I wish I hadn’t read this bit), harpsichord, bass and keyboards. Accompaniment is provided by Brian McGrath (piano and banjo) and Frank Kilkelly (guitar) while there are also guest spots for Éilis Lennon (fiddle), Brian Lennon (flute), Johnny Connolly (melodeon), Johnny Óg Connolly (accordion), Steve Simmons (guitar) and Emmett Gill (uilleann pipes).